How many times have you heard that you should start your golf downswing from the ground up? What does that even mean? You know it's important, but don't know how. That's what I'm here for. In this new premium video, I'm going to show you why you struggle to have a proper golf swing transition and show you the secret to developing a properly sequenced downswing where this happens automatically. Go to the top of your swing and determine what part of your body has the most tension. To get your muscles to fire in order, you must load them in order. Shift your weight and load your trail side glutes up first. Focus on load and rotation to start the swing. Arms and shoulders should stay as relaxed as possible so they are not the first muscles to fire in the downswing. How many times have we heard over the years have we heard the expression of starting the downswing from the ground up? We have heard this expression for as long as I can remember and from some really great teachers and even some of the best players to ever walk this planet. After hearing this expression for all these years, how clear are you on the topic and how well is it working in your golf swing? Most golfers have never really been taught clearly how to perform a downswing in golf from the ground up. Well, great news, we are going to show you exactly what it means and more importantly, we are going to show you how to put it to use in your own golf swing. Question: Why do most amaetur golfers start the downswing from the top of half of their body and not the lower half? Answer: Your body is going to use tension as it's primary indicator in the golf swing to determine which muscles to fire and in what order. That answer alone, should be the big lightbulb moment on why you cannot build a downswing from the ground up, no matter how hard you have been trying. 1. Pushing the club into the takeaway with your lead arm/shoulder. 2. Fulling setting the club with your wrists to get the golf swing started. Take a club out and swing to the top of your backswing and freeze. Determine where you are feeling the most amount of muscle tension in your body. I would be willing to bet that you feel in mostly in your shoulders and arms. If this is the case, THEN YOU MUST KEEP READING! Clearly it is going to be much harder to build a golf downswing from the ground up if you have fully loaded up your much smaller shoulder and arm muscles. Why you ask? Because muscle groups do not want to stay fully contracted for long. They want to fire and go! How do we fix it? Tell your body the right signals! Load up your right leg (trail leg) by shifting your weight to start the swing. A simple drill to help you do this is, pick your right heel off the ground and then push it down into the ground with some force. This will teach you to shift your weight and also get your glute muscles and other important leg muscles woken up first. Now that you have shifted your weight and have the lower body loaded up properly, you need to prioritize rotation of you core muscles. Feel like you are winding your guts up as much as you can, all while keeping the arms and shoulders as relaxed as possible. There you have it, now you have created a backswing that has signaled to the body that you want your lower body to fire first. Start without a club first and cross your arms over your shoulders. Work on shifting, loading and rotating. Once you have that mastered, add the club back to the mix and focus on the re-creating the same body movements you were just performing. Now that we are properly loaded, you can start working on shifting your weight by picking your left heel (lead heel) up off the ground. Push the heel back down into the ground with some force, stomp it! Try and here your own stomp. This is going to force you to shift most of your weight and get those big leg muscles used for leveraging the ground and stability woken up. Check out a great video called “how the lower body works”. This will show you a great stride and stomp drill. By stomping and shifting you have now pulled your upper body into the hitting area where you will be releasing the club with so much speed. That is exactly how you build a golf swing from the ground up! Hi, Chuck Quinton, founder of rotaryswing.com, here. I want to talk about a really important concept that you've heard a million times, but probably still to this day, no matter how hard you've tried, no matter what else you've done to try and drill this into your golf swing, you haven't been able to do it. And that is, starting your downswing from the ground up. How many times have we heard that? Jack Nicklaus, everybody under the sun, start the swing from the ground up. Use your legs for power. Yet nearly every amateur golfer that I teach starts their swing from the top up, or top down. Why is that? It's a really simple yet really important concept, and it's going to help you understand why it is that you can't do this, and what it's going to take to be able to do it. Let's take a look at what causes you to start from the top down instead of the bottom up. The reason is, is that your body is going to use tension as its primary indicator of what muscles to fire in what order or sequence. The body is really, really clever in that it listens to you when you tell it what it is you want it to do. We're just usually giving it the wrong information. That wrong information is tension typically in the upper body, or the shoulders, this area we refer to sometimes as the rectangle. You want to swing more from your core, from this top of the downswing. And you know that, but no matter what you try, you still can't do it. It's because you're giving your body the wrong signals. When you go to the top of your swing, stop and see, which muscles are the tightest in your body. What you'll probably find in most instances, it's going to be these muscles up here in your shoulders and arms. Of course, what you're telling your body is, "Hey, these muscles are really tight." What does your muscle want to do when it has a lot of tension in it? It wants to release the tension, of course. What you've got to do is start telling your body the right signals, but before we do that, let's look at what is typically the wrong signals to send to your body. The wrong signal is when you first start the club going back, and you take this lead arm, we're going to refer to as pushing, and you start pushing this across your body. Instantly I feel tension in the upper part of my back, and the rear delt, and my shoulder here. As I've done this, I've now gone where I've moved my arms and club a long ways, but my body hasn't really turned much. I haven't created any healthy tension or load in my trunk, my core, the area we call sometimes the box. That's this area from here to here, basically. Instead, I'm loading up my shoulders. By the time I get here, I'm so tight that guess what my body wants to do? It's got to get rid of this tension in my shoulders. Of course, it does. As you're doing this, if you don't start using your body to load and load these muscles up in turn, your shoulders are going to get loaded long before the big muscles do. By the time you get here, you've got to fire from the top. Your body, instead of using your legs to go to shift your weight, and so on and so forth, in the downswing that you know are good things you want to do, your body just freezes to try and keep you from falling on your face, because you're creating all this force going out away from you. All of a sudden, you've got a bad golf swing. How do we fix it? That's the key. The most important part of learning RST, or any golf swing for that matter, is learning how to load your body first, and use your body to swing from the inside out to move the club correctly. Here's how we do that. First, throw the club down. You don't need it anymore. You need to learn how to use your body first. It has nothing to do with that golf club. Take your arms across your shoulders. The first thing I want you to do, lift your right heel up in the air, and plant it on the ground. As you do that, push it into the ground, and let your upper body turn and rotate on this hip. I want you to load and create tension. I feel a lot of load in my quad, my hamstring, and primarily my right glute. As I'm doing that, I'm going to keep the flex in my knee. It's okay if we were to straighten up a little bit, but what I see all the time is people swinging with their arms. Their right leg straightens up, and all of a sudden, they've got this move going on. As you go back, lift your right heel up. The right heel gives you something to focus on pushing it into the ground, which gives you a little mental cue to load that right glute. As I lift it up, push it into the ground, and now all of a sudden, I feel loaded and powerful as if I could move and jump that way. Granted, we don't want to push that hard off the right leg, but it's okay to use it. The primary thing we're trying to do is get load and stability in there so that we can have a powerful move coming down. As we do this, right heel up, plant it in the ground, turn. Now my shoulder, completely relaxed. It can hang out here all day, but I've still made a full shoulder turn. My right leg is loaded up. My trunk, importantly, my core, is now really loaded up, so guess what's going to want to fire first? Not my shoulders, because they're relaxed. I'm loaded up here, my abs, my core, my obliques are loaded. Now the first thing I'm going to do is what? You know this. You need to shift your weight back to the left. How do I do that? Again, give yourself a little help. Give yourself a little mental cue. Lift your left heel up now, and stomp it into the ground. Now as I do this, when I say stomp it, I mean I want to hear it. Stomp it, because now as soon as you do that, the muscles in the left side that you need to use to post up on, and drive up to rotate your hips, are going to be activated. Lift the left heel, stomp it into the ground. As I'm doing that, I'm also using my leg to push my hips back out of the way to get my shoulders squared up into impact from the down the line. Now I'm going to lift my right heel, stomp it, load it up, shoulders are relaxed. I'm going to lift my left heel, stomp it, post up, and now you'll see my shoulders are at impact. I didn't move my shoulders. In fact, my shoulders have been chilled out and relaxed this entire time. Right leg, left leg. Now I'm in a great impact position. And this, all of these big muscles, these big thick, dense muscles in my hips, my core, my quads, my hamstrings, have done all of the heavy lifting to move my arms and shoulders into impact without me having to use my arms and hands to get in the hitting area. Focus on getting your core rotation first. Then worry about what the club and arms are going to do in the swing. 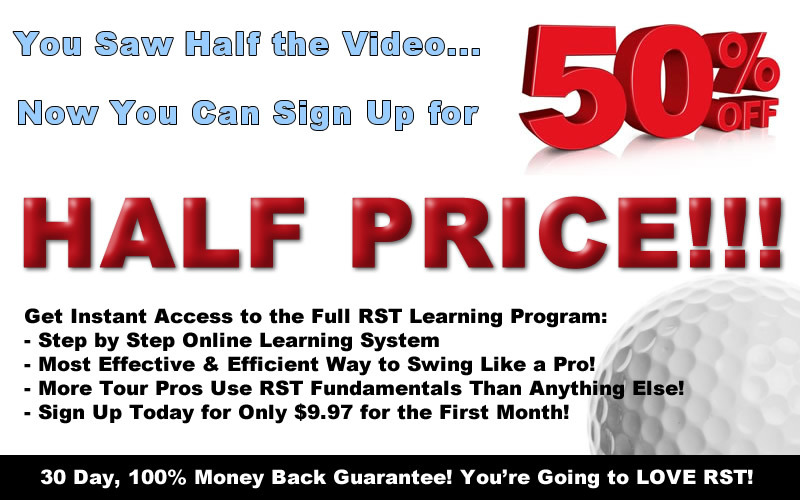 Get Your Free Membership to Finish Watching "How to Swing From The Ground Up - Golf Swing Transition" Right Now!